An expert in mental disease. 1. A reference to psychiatry, the science concerned with the study, diagnosis, and prevention of mental illness. 2. Pertaining to or within the purview of psychiatry. 1. 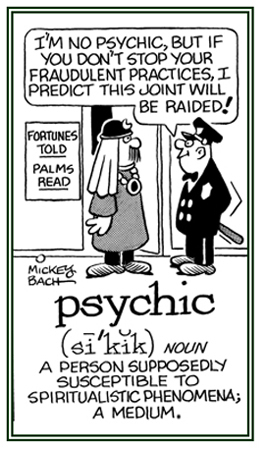 An individual who claims to be endowed with semi-supernatural powers: A psychic supposedly has the ability to read the minds of others or to foresee and to reveal coming events. 2. Etymology: from Greek psychikos, "of the soul, spirit, or mind" from psyche, "soul, mind." © ALL rights are reserved. The theory that a principle of life pervades all nature. A reference to the study of the relationship between the perceptions of sounds and their physiological and psychological effects on people: "Scientists are discovering that some psychoacoustical sounds cause hearing loss that is often misdiagnosed as an effect of aging." An expert or specialist in the prognosis and treatment of mentally processed sounds that are imaginary: "Nancy was admitted to the psychiatric ward of the hospital under the care of the psycho-acoustician who was familiar with patients with imaginary perceptions of sounds." "According to a psychoacoustician, most people perceive airplane noise as if it were 10 dB greater than a similar noise that is made by a train; or ten times noisier than a train even when the noise levels of both are objectively the same." 1. The science that deals with the perceptions of sounds and the productions of speech: "In the local university, there is a course offered on psychoacoustics into which many speech therapists enroll." "While working in the mental health unit at the hospital, Dr. Kitchen observed patients when different kinds of music was played, hoping to write a scientific paper on psychoacoustics for a professional journal." 2. A discipline combining experimental psychology and physics that deals with the physical features of sound as related to audition, as well as with the physiology and psychology of sound receptor processes: "The local university's psychology and physiology departments were the primary organizers of an international convention that was being planned in the city for scientists and practitioners of psychoacoustics." 3. The scientific investigation of the way in which animals and humans hear, particularly the reception and analysis of the input signals: "Dr. Laurie specialized in psychoacoustics, studying the relationship that exists between sound receptions and the biological processing of sounds." A drug that produces stimulation; a psychic energizer. 1. Affecting the mental state, such as a drug that has that result. 2. Possessing the ability to alter mood, anxiety, behavior, cognitive processes, or mental tension; usually applied to pharmacologic (drug) agents. 1. A condition of hypersensitivity or over reaction to certain ideas, words, persons, or situations because of their symbolic significance. 2. A sensitivity to emotionally charged symbols. Showing page 7 out of 18 pages of 264 main-word entries or main-word-entry groups.